...to bring you news of a couple of money off vouchers for our affiliate UKSoccerShop. These vouchers are valid until the 11th November and run across the entire product range that the store offers. They are also valid worldwide for anyone outside the UK who wants to purchase their products. 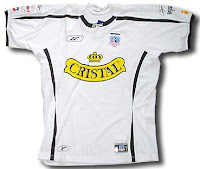 UKSoccerShop have a wide range of football shirts including those for club sides from Argentina, Brazil, Chile and Mexico.